Back in January this year I was given the opportunity to try out some hair products from the renowned French hair care company, Leonor Greyl. As you will know from reading this blog, I have terrible trouble finding natural hair care products which suit my hair. I have very thick, long hair and most natural brands do not provide the necessary results I need, from a shampoo in particular. I am therefore always on the lookout for others, so I couldn’t pass up this opportunity. Having previously lived in Brittany, France for just short of 3 years I also understand how important hair is to the average French woman. They are very passionate about how they look, and there are excellent hair salons in every town and village however small. Leonor Greyl have been around for over 45 years and set out with a very clear intention that they wished to use natural ingredients in their formulations. At that time they were the exception rather than the norm, however almost half a decade on they are an integral part in many women’s hair care routine and loved all over the world. All their products are free from parabens, silicones, SLS, coaltar and not tested on animals. 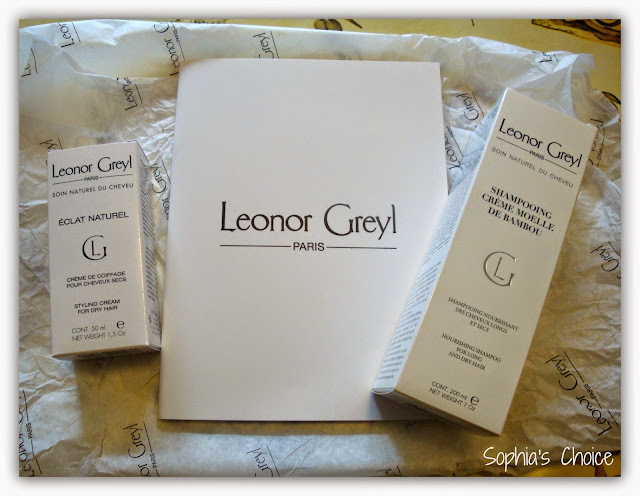 “LEONOR GREYL is a brand, a range of hair care products, an Institute, and a family business. In 1968, esthetician Leonor Greyl, with future husband and amateur naturalist Jean-Marie Greyl, created the LEONOR GREYL brand from a simple idea: healthy, natural products = healthy, beautiful hair. At the time, ‘natural’ was not yet in vogue – hair care was largely a chemical process, sometimes harsh – but Leonor and Jean-Marie’s natural products were a hit. With humble beginnings in a single salon in Paris, their unique products (Magnolia Oil, Honey Shampoo, Wheat Germ Oil, Cream of Flowers) are today some of the most popular and sought after treatments by prestigious hairdressers and top models in Paris and worldwide. LEONOR GREYL is the brand specialist in hair treatments using only high-quality, environmentally-safe, natural ingredients: honey, bamboo, sunflower, and chamomile, to name just a few. With blends of delicate aromas and plant extracts, LEONOR GREYL products give hair brilliance, glamour, beauty…and health! I was sent their Shampooing Crème Moelle De Bambou which is a nourishing shampoo for long, dry hair and also the Éclat Naturel which is a styling cream for dry hair. Now I have to say that my feelings on the Leonor Greyl products I used are mixed and I did have a few email chats with them about this. More will become clear as you read on. The first product I tried out was the Shampoo. As described on their website: “Based on natural active ingredients (wheat derivatives, carrot, silk proteins and bamboo marrow), this shampoo repairs the hair fiber from the very first application. It works to regenerate the hair, restore instant shine, flexibility and manageability. This shampoo doesn’t really lather and is a cream gel consistency if that makes sense. That lack of lather is common with more natural shampoos as they do not contain SLS. I did find it hard to work into my thick hair, with the roots being the one area that shampoos without a lather tends not to reach very easily. I tended to therefore use more of the product than most people would to get right down to this area. It cleaned my hair but I didn’t get the satisfying squeak I like to have from a shampoo. I have to say that I have only found one natural hair care brand that has given me that squeak which is a shame as what tends to happen is I revert back to an SLS shampoo every once in a while just to get my hair squeaky clean. The shampoo left my hair soft but I found that like many natural brands I’ve used, I was washing my hair more frequently than I normally would. I sadly wasn’t overly keen on the fragrance. It is very strong and what I’d called “typically French”. By that I mean that it is highly perfumed and floral. The French are well known for their incredible perfume combinations, so the fact that this is a strong scent does not surprise me. However, it wasn’t for me. They also use synthetic fragrance in this shampoo which could also explain the strong scent. I found that using this shampoo over a period of time made my scalp itchy and sore in places. I have experienced this when using Gielly Green’s shampoo as well and like Lenor Greyl they use MIT and MIC. I can only deduce from this that I have a sensitivity to these ingredients. Now some of the issues I have with this shampoo are that it has MIT, MIC, PEGs and synthetic fragrance. For a brand that classes itself as natural that surprises me. I asked Leonor Greyl why this was and their Research and Development team were very good at explaining their position on this. Shelf life is a big thing here. Their products have a shelf life of 3 years and they explained that MIT and MIC are great preservatives and they use them in their shampoos according to new regulations. MIT will soon be forbidden in products which are not rinsed off. Their argument that more natural preservatives do not give a long enough shelf life and cause more irritation than their synthetic brothers is I feel not a strong enough argument for using MIT and MIC but this is my personal opinion. I’m not naive to the fact that products whether natural or not have to be preserved for safety but there are companies out there who have managed a long shelf life without the use of MIT and MIC. With all the recent news coverage of people reacting to these preservatives particularly MIT I’m surprised they are still being used in natural bodycare products. The debate about synthetic fragrance and essential oils is a difficult one. I personally do not agree that the sole use of essential oils to perfume a product would make them smell more like a pharmacy. I know many brands who have very successfully utilitsed essential oils into their formulations to stunning effect; two of my favourites being Bodhi and Neal’s Yard Remedies, so I’m not in agreement here. With regards to the allergen issue, I understand that this can, for some, be a problem particularly with the use of essential oils, but there are natural hair care brands out there using essential oils which are gentle and less likely to cause irritation or none at all. So it can be done. I think I need to do far more research into PEGs to understand more. Leonor Greyl feel that the use of all the above ingredients allows them to make high performance, long shelf life products which is very important to them. Whilst I understand and respect that standpoint, the jury’s still out on whether I can be persuaded by all their arguments. What I will say is that I liked the Éclat Naturel Styling Cream. It was a lovely texture and smelt delicious; almost fruity. It helped to protect my hair from the ravages of the hairdryer and I enjoyed using this over the period of time I tested the two products. I know that Leonor Greyl use a high percentage of organic ingredients in their formulations and pride themselves on their 45 year plus history in the industry. You don’t last that long without being good at what you do. However, for this girl at least the use of synthetic ingredients in the majority of their hair care products is for me anyway a step in the wrong direction. Will I be using their products again? Perhaps. From the reviews I have read, their hair oils come highly recommended, so perhaps I’ll give one of those a go before making my final verdict. If you’d like to connect with Leonor Greyl then they have their European website and their US one which is the only one to list ingredients. They are also on Twitter and Facebook. 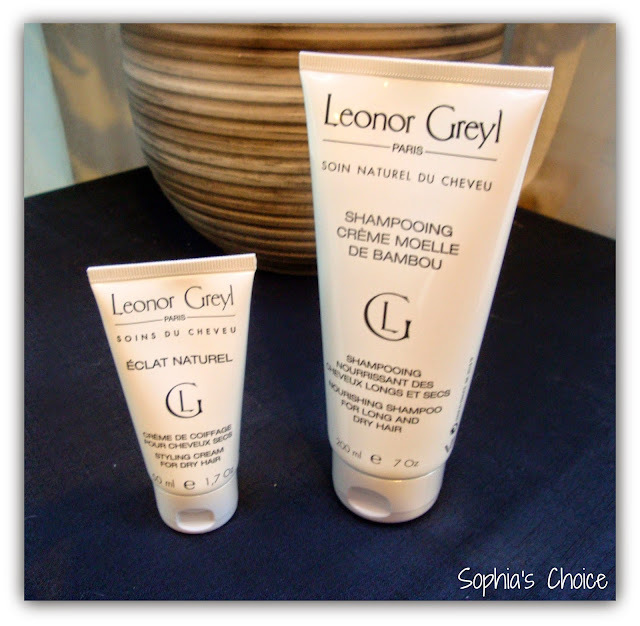 Have you used Leonor Greyl’s hair care range and what are your thoughts? I’d love you to leave your comments. Disclaimer: I was given a 200ml bottle of Shampooing Crème Moelle De Bambou and a 50ml bottle of Éclat Naturel to try out for review. All opinions expressed are my own, honest thoughts and feelings on the products I have tried.